PROPER CARE & MAINTENANCE OF CUSTOM CONCRETE FLOORING - Steve's U-Cart Concrete, Inc. While most types of custom concrete flooring requires a lot less maintenance and care compared to traditional flooring materials, it is still important to maintain your new floors to preserve them and increase their longevity. It is important to speak with your professional concrete flooring installer for care instructions and a list of do’s and don’ts before you use any type of chemical cleaners or treatments on your new stained concrete flooring or stamped concrete flooring. However, the list of tips here can be used with most styles of custom concrete flooring. The best way to reduce the amount of maintenance and care required to keep your concrete floors looking like new is to prevent damage from occurring in the first place. When moving heavy furnishing that might damage your stained concrete flooring or stamped designs, take advantage of felt padding, Magic Movers and other plastic glides. Treat your new flooring as you would a hard wood floor. While custom concrete flooring is more durable than convention flooring materials, it is easy to accidentally abuse it as a result. Adding door mats, runners and other rugs that include a solid backing can help to reduce the amount of dust and dirt in your home. Do not use rugs with plastic backing, as they can cause discoloration, particularly with stained concrete flooring. One study showed that a simple rope rug placed inside the entrance of a home can pick up as much as 85 percent of dust and dirt that would otherwise end up on the floor. This will also help to reduce the frequency that would be required to keep your new custom concrete flooring clean. The best way to keep your new flooring clean and dust-free is to mop it daily with a dry dust mop. This will remove all of the fine grit and dust that can eventually grind away at your floor’s custom finish. A micro-fiber dust mop is typically suggested by most concrete flooring installers because it is gentle, quickly trapping and holding dust and dirt. Some homeowners prefer to use a vacuum cleaner instead to ensure that all the dirt is removed. It is important to never use harsh cleaning products, such as ammonia or bleach. Name brand products, such as Mr. Clean and Pine Sol are also too strong for custom concrete flooring. 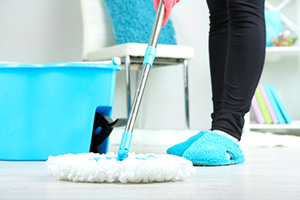 Popular mopping tools, such as the Swiffer wet cleaners can also damage your new floors. If you must damp mop, simply use cool water. Cleaners with a neutral pH can also sometimes be used. Again, check with your professional concrete flooring installer before you use any type of cleaners on your new floor. Depending on the texture and type of your custom concrete flooring, a wax coating might be used to preserve your new floor. Waxing wax is used to act as a “sacrificial coating” that will take most of the abrasion and scuffing that could potentially damage your flooring. Not all types of concrete flooring will benefit from this treatment, but high gloss polished flooring and some types of stained concrete flooring will. Again, the products that you use and the methods used to apply them will depend on the materials and tools used to create your flooring. While your concrete flooring installer will likely provide you with information about any waxing wax used during the installation of your new floor, along with care instructions for adding wax again in the future, don’t be afraid to double-check before using any waxing product. Do not use cheap wax-cleanser combination products, such as Mop-n-Glo and other products available at your local grocery store. Issues, such as streaks, spots and discoloration can sometimes be cleared up using basic maintenance and care instructions without having to call out your concrete flooring installer for professional help. Here are some troubleshooting tips that can help you to get your stained concrete flooring back to normal. Contact the friendly professionals at Steve’s U-Cart Concrete in Calgary- (403) 266-5221 to get you started on your concrete project!